Cells cultured in Petri dishes are a popular research tool used in numerous applications, including patch clamping and intracellular ion probe imaging. True perfusion (continuous inflow and outflow) of solutions can be difficult to configure. This forces scientists to plate cells on cover slips for placement into specially designed perfusion chambers. However, such transfer is a time consuming process which introduces the potential for contamination plus additional expense. The PCP-1 chamber was designed by scientists after years of patch clamp research to overcome this problem. 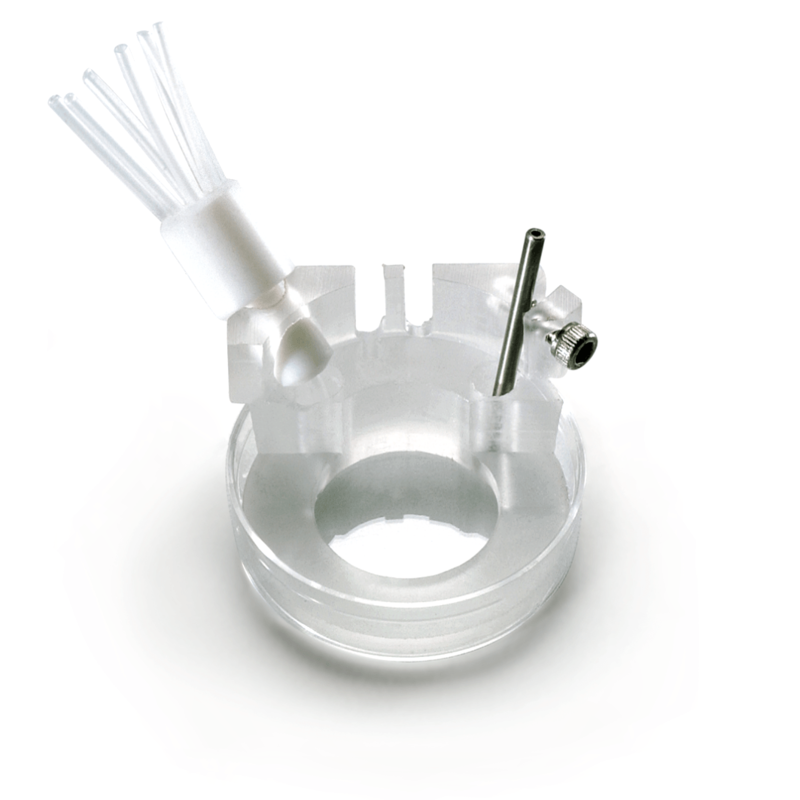 Perfuse cells right in your Petri dish with any perfusion system and an optional PTFE inert manifold (sold separately). Ideal for inverted microscopy using optically clear Petri dishes. Adjustable metal suction tube included. Dimensions: 35mm, outside diameter x 20mm tall. AutoMate’s Petri Dish Perfusion Chambers work well with MatTek’s 35mm Glass Bottom Culture Dishes, allowing researchers to produce high-resolution microscopic images of cultures growing in a standard-size 35mm disposable plastic Petri dish. Please visit www.glass-bottom-dishes.com. Dr Johnathan E. Freedman, Ph.D.